Light or dark, fire or ice – which will you choose? In Dragon Sisters, you can have both! 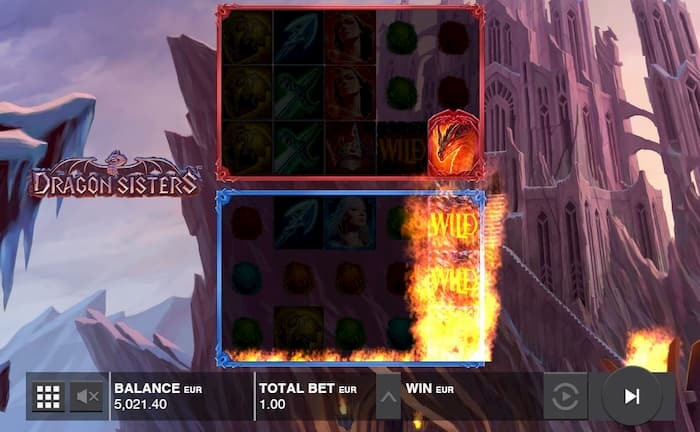 Join the two beautiful sisters as they command their dragons to reward you with Random Wilds or Stacked Wilds during their respective Respins. Which dragon will reign supreme? Dragon Sisters features 5 reels and 3 rows, but on two separate screens. That’s right; each sister has their own 5×3 reel that spins with each round. 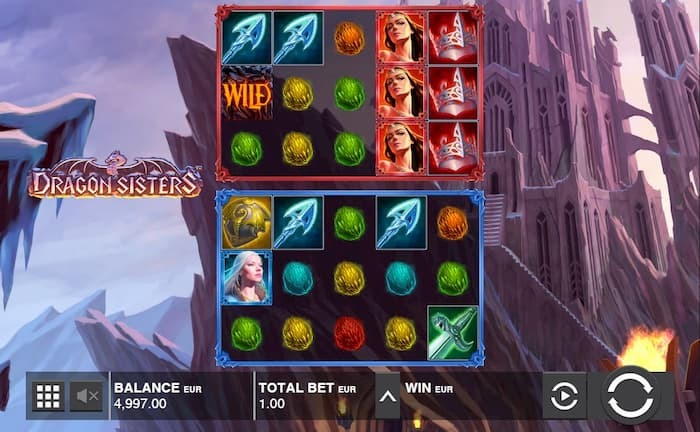 The game symbols are almost identical on both screens – with colorful gems as the low-paying symbols and a sword, spear, shield, and crown as the high-paying symbols. The only difference is the presence of the two sisters and their respective dragons. On the top screen, The Dark Sister and her Red Dragon find their home. The Dark Sister is the highest-paying symbol there. On the other hand, the bottom screen holds the Light Sister and her Blue Dragon. Like the Dark Sister, the Light Sister is the highest-paying symbol on the bottom screen. 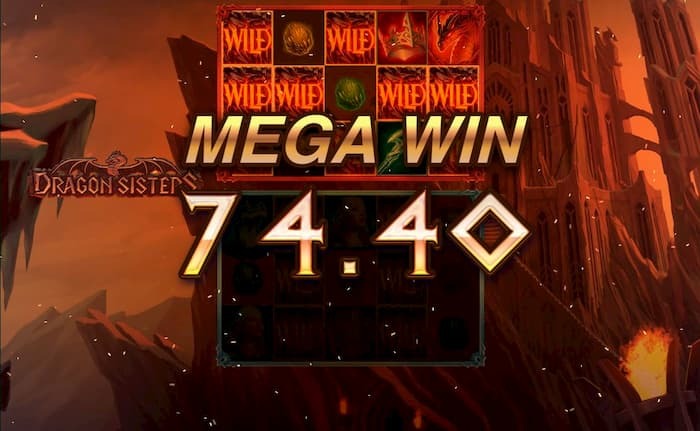 The Wild Symbol appears on both the top and bottom screen during regular gameplay. It can substitute for all regular symbols, including the Dark and Light Sisters. The only symbols it can’t replace are the Red and Blue Dragons! Additionally, the Wild Symbol rewards its own high payout when 3 or more form a part of any of the 24 fixed paylines. Whenever the Red Dragon appears on the top screen, it breathes a trail of fire onto the reel directly below it on the bottom screen. When the fire dies down, a full stack of Wild Symbols will appear in its place. With the Stacked Wilds stuck in place, the bottom reels will respin. The Blue Dragon on the bottom reel will trigger a respin as well, but this time of the reels in the top screen. When the Blue Dragon appears, it’ll shoot up to 3 balls of blue fire onto random positions on the top screen. When the fire fades, Wild symbols will appear in their place. The Random Wilds will remain in place and the reels in the top screen will spin again. Respins will continue until no more Dragons appear. 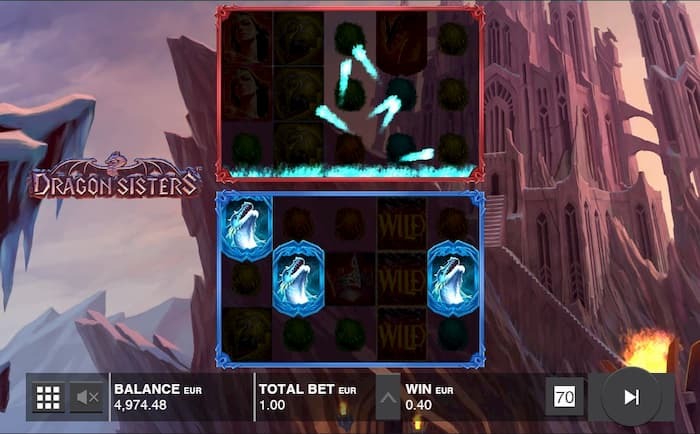 Dragon Sisters gives you twice the chance to win with its two simultaneous game screens. With the fantasy-themed background music and graphics, it’s certainly a game that’ll take you back to the medieval times of princesses, knights, and dragons. 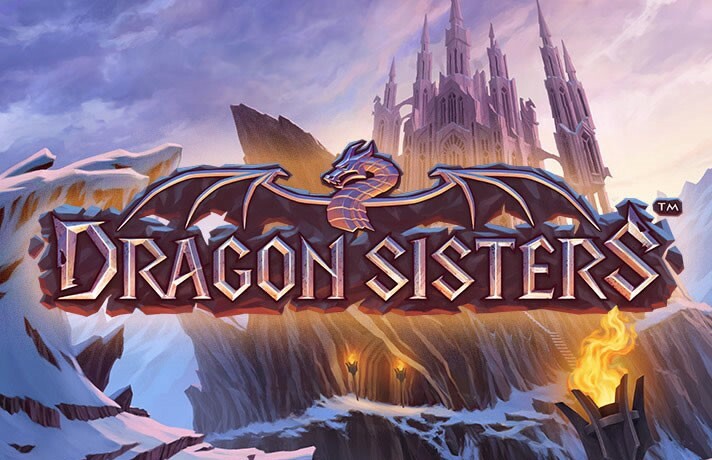 Play Dragon Sisters today!